Serres, Jean de. The three partes of commentaries, containing the whole and perfect discourse of the civill warres of Fraunce, under the raignes of Henry the second, Frances the second, and of Charles the ninth. Trans. Thomas Tymme. London: Frances Coldocke, 24 August 1574. 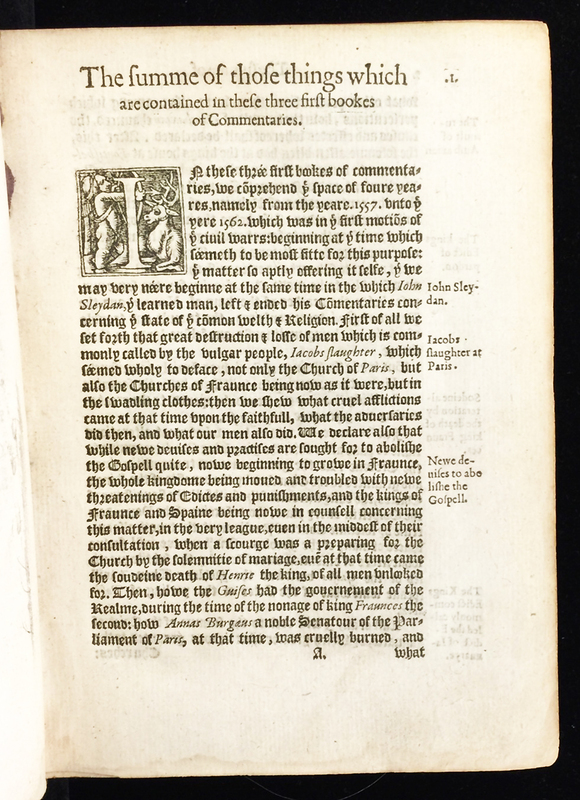 Morris also owned the fourth part (printed by Henry Binneman for Humphry Toy), separately published in 1576, and his copy consisted of all four parts bound in a single volume. Provenance: Charles Sutton. — Walter Thomas Wallace. — Morris. — Richard Bennett. — Sotheby 1898, lot 877 (sold to Pickering for £3 18s.). — Catalogue of Old and Rare Books, Pickering & Chatto, 1900, no. 1110 (£7 7s.). — Edwin N. Lapham. — Lapham sale, Anderson Auction Co. (New York), 1–3 December 1908, lot 1050 (sold for $21). — Huntington Library (69408 pt.1) [parts 1–3]. — Huntington Library (69408 pt.2) [part 4]. Nicolay, Nicolas de. Les navigations, peregrinations et voyages faicts en la Turquie. Antwerp: Guillaume Silvius, 1576. Provenance: Morris. — Richard Bennett. — Sotheby 1898, lot 689 (sold to Henry Wellcome for 9s.). — Wellcome Library [deaccessioned]. — Unlocated. Mexía, Pedro. The forest or collection of historyes no lesse profitable then pleasant and necessary. Trans. Thomas Fortescue. London: printed by John Kingston for John Day, 1576. Provenance: Morris (purchased for 10s. 6d.). — Richard Bennett. — Sotheby 1898, lot 303 (sold to J. Jones for £3). — Unlocated. References: Ellis valuation, fol. 49b (no price). — ESTC (S112658). — MS catalogue (1), fol. 13. — MS catalogue (2), no. 15 (with three X’s beside the title).